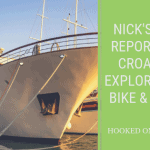 Hooked on Cycling Holidays offers and superb self-guided cycling holidays in Slovenia from the capital Ljubljana to the Adriatic coast. From Ljubljana, the cycle tour City to Sea takes you in a south westerly direction from Ljubljana the Slovenian capital to Piran very close to the border with Italy. Day 1 – ARRIVAL TO LJUBLJANA. Arrival in Ljubljana and your chance to explore the capital. Today you will have your bike hand over the meeting and meet our representative in the late afternoon. The main attractions today in the Slovenian capital are the old town centre, and the lovely “fin de siecle” mansions, which are mighty fortresses above the city. Today’s cycle tour goes across Ljubljansko Barje a large flatland and former marsh area surrounding the capital. Today the terrain in mostly flat. Today you can take a short walk into Iski Vintgar gorge nature reserve, see the remains of the world’s highest railway viaduct in Borovnica., For the Museum fans a lovely technical museum of the republic of Slovenia where there are a great hunting collection and an exhibition on Titos’ cars. A slightly hillier day using side roads with some flat sections across typical Carst fields. You will also cycle through the nature reserve Rakov Škocjan which is an ideal place for a picnic. Today you see some of the real Slovenia, you will be away from main tourist routes and off beaten track. Day 4 – POSTOJNA – ŠTANJEL / KODRETI 26 miles 42 km. Today is an easy route with one long descent but some small hills afterwards. You will have a possible detour to Predjama castle. The last Slovenian knight once owned it. Learn about his romantic destiny as you walk around this fabulous castle. Also, you can visit the Postojna caves, a world famous attraction, so far nearly 30 million visitors! Beautiful lime stone formations, not forgetting to mention the unique “human fish”! Day 5 – ŠTANJEL – LIPICA – DIVAČA 30 miles 48 km. Today you are cycling on rolling terrain with some flat sections. Your first stop can be at the lovely botanical garden in Sežana, then it’s on to the stud farm of Lipica, where you can visit the beautiful thoroughbred Lipizaner horses whose glistening white coats and gentle, graceful dancing have earned them a worldwide reputation. The history of the Lipica horses is closely linked to the Vienna riding school. You can take a tour in a traditional carriage, watch the horses perform and visit them close up in their stables. This will be a day to remember. If you have the time for a couple of side-trips, you can also visit the unusual but very interesting “War Museum” set in the village tower of Lokev. Day 6 – DIVAČA – MUGGIA 24 miles 38 km. If you skipped the caves in Postojna, this morning you can visit Škocjan Caves, no less interesting but way less frequent, they are even listed as a UNESCO natural monument! You can take a slight diversion into the Italian town of Trieste, once an important port with its worldly flair and wonderful atmosphere. Visit the castle, cathedral and Piazza Unita central square. Trieste was once part of Slovenia whilst under the rule of the Austrian monarchy. Relax with a cappuccino in the many old-fashioned cafes. From here you cycle along the coast to your destination Muggia just south of Trieste. Today you cycle along the coastal road on new cycling path following a former railway line. Enjoy great vistas of Slovenian coast and of Trieste Bay. A coffee stop in the fashionable resort of Portorož is a must. The trip ends in the gorgeous Venetian little harbour village of Piran. Day 8 – DEPARTURE FROM PIRAN. The terrain is fairly easy making this a tour suitable for beginners.